02.09.13 In an article that appeared in the Maine Organic Farmer and Gardener December 2012 - February 2013, Common Ground Country Fair Director Jim Ahearn wrote, "One of my favorite images from this year's Fair was the sight of kids playing chess in the new Farm & Homestead Kids Activity Area. In the midst of 20,000 people was a chessboard on a table, tucked quietly off the busy thoroughfare, seemingly under the watch of apple trees. Time and again throughout the weekend, a changing cast of young fairgoers sat there in quiet concentration." Fair director Jim Ahearne with (left) Fair assistant Renata Christen, Fair coordinator April Boucher, and Fair volunteer coordinator Eleanor Salazar (right). English photo. Many of the questions I get about the Common Ground Country Fair begin with, "How many." "How many people were at the Fair this year?" 59,067. "How many vendors and exhibitors were there?" 726. "How many people rode the train?" 2,670. And so on. I suppose numbers can be clean and compact, easy to hold and store. Waypoints in a story. Even from my vantage point, I get to take in but a sliver of all the Fair has to offer and of all that's created by those involved. I say created because the Fair doesn't so much happen but is renewed each year by the vision and industry of coordinators who volunteer their time and dedication, by exhibitors and vendors who bring their work and passion to share, and by volunteers who help in immeasurable ways. One of my favorite images from this year's Fair was the sight of kids playing chess in the new Farm & Homestead Kids Activity Area. In the midst of 20,000 people was a chessboard on a table, tucked quietly off the busy thoroughfare, seemingly under the watch of apple trees. Time and again throughout the weekend, a changing cast of young fairgoers sat there in quiet concentration. The Fair can be a whirlwind of activity that leaves us spinning, but in its core is a touchstone that reminds and affirms. I like the way our Fair office assistant Renata Christen put it: "Having neighbors and friends and familiar faces to connect with is the whole point." "Neighbors." "Friends." "Familiar faces." "Connect." Words to celebrate and live by as we strive to create, in the words of Russell Libby, "a more local and more organic agriculture." 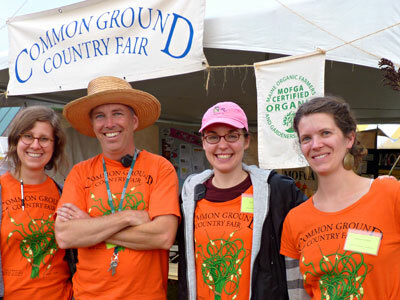 Thank you to all the neighbors, friends and faces familiar and new who infused the 2012 Common Ground Country Fair with their vision and talents, aspirations and work, support and joy. RIP Russell Libby. I was shocked and saddened when I heard of his recent passing.